A massive Great White Shark... Frightening. Huge sharks chasing fish and cruising off holiday beaches pose a threat to swimmers as warm weather draws sunlovers to the coast. Police in South Australia renewed warnings to swimmers at the West Coast holiday spot of Streaky Bay, where a monster great white has been seen cruising close to shore, The Advertiser reports. The five-meter (=16.4 feet -MB) shark had been seen in the water around Streaky Bay township and Little Islands for the past three weeks, police said. Today’s warning follows an incident yesterday in which a man in a dinghy was attacked by a shark while fishing off North Haven at Gulf St Vincent. The fisherman phoned police after a bronze whaler circled his dinghy and bit into the hull and motor. The boat suffered minor damage and the man managed to get to shore. 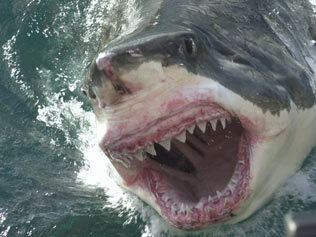 A shark with a similar description was spotted hours earlier about 4km from shore near Glenelg. Shark numbers tend to increase between November and Christmas as they follow schools of fish up Gulf St Vincent. Water police said shark sightings were common in deep water and they posed a significant risk to humans only when 1km or closer to shore. However, temperatures are expected to climb into the 30s across the state this week and the beach season has begun.